Over the last year, I have played a small part in the development of the much anticipated new release of Need for Speed. 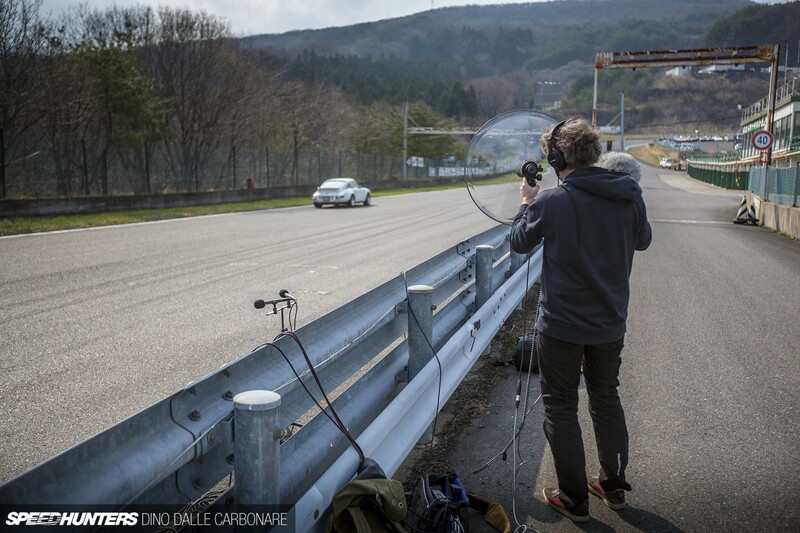 On top of various reference shoots to help the crew at Ghost accurately recreate the cars, aero kits and wheels we all love, I was also called on to relate what Japanese car culture is all about and show its various facets so that it could come across at the core of the game. The more I helped, the more I realised the monumental job that putting a game like this together must be; not only having to live up to one of the most successful franchises out there, but also to push the boundaries in many different ways. There’s so much that the programmers, engineers, artists and developers have to do that it boggles my mind how it all comes together so beautifully in the end. But it was a week back in April that will forever be cemented in my mind; an experience that further reinforced the sheer amount of detail that the NFS team go down to in order to deliver the best product they can. The operative word for this project was sound. Think about it, isn’t the engine sound that you hear in a car game one of the first things you notice and comment on, and perhaps even criticise for a lack of realism? 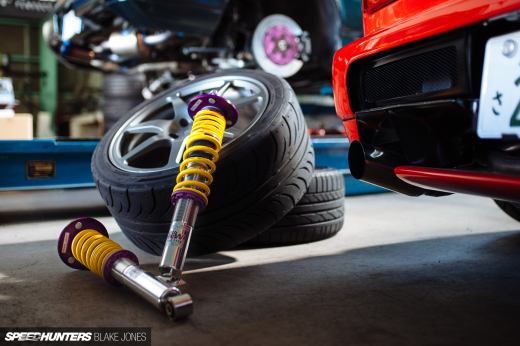 I know this is one angle of games that I’ve always been pretty strict about, after all, if you are a car otaku, sound is definitely something that you take pretty seriously. I know I do. And boy was I about to get a very graphic demonstration of just how much importance the guys at NFS put on this aspect. Now, before I go any further, no, the BMW i8 will not be in the new NFS game. 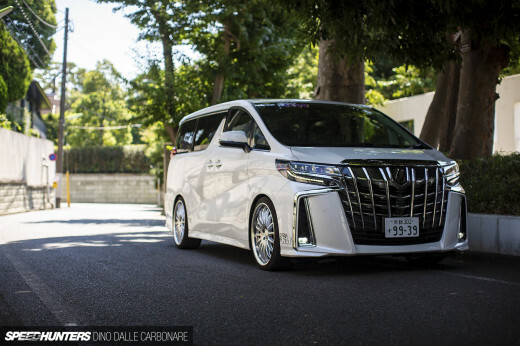 So why was it one of the five cars that I organized to come up to Ebisu Circuit? Simple, it’s electric – or at least partially – but it has an electric mode where you can drive it just on the juice stored in its battery pack. This, as the three audio engineers who flew over from Sweden told me, would be the cleanest and most accurate way to capture the true sound of the tyres. More specifically, the noises they make rolling at slow speed all the way through to squealing for dear life when you push them beyond their grip capabilities. Studie AG was good enough to send up its brand new i8, the boss’s car, knowing full well that it would be properly used and abused by yours truly. 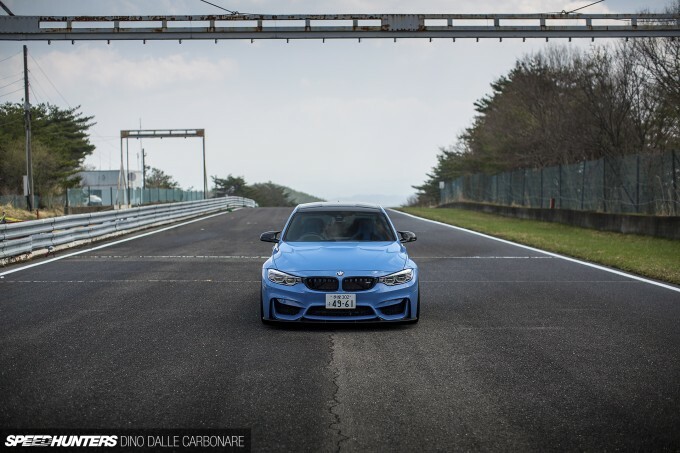 Yes, that’s right, I actually got to drive the hell out of most of the cars you will see in this post at a deserted Ebisu North and East course – tracks we had rented for the week. It’s a tough job, but someone had to do it! 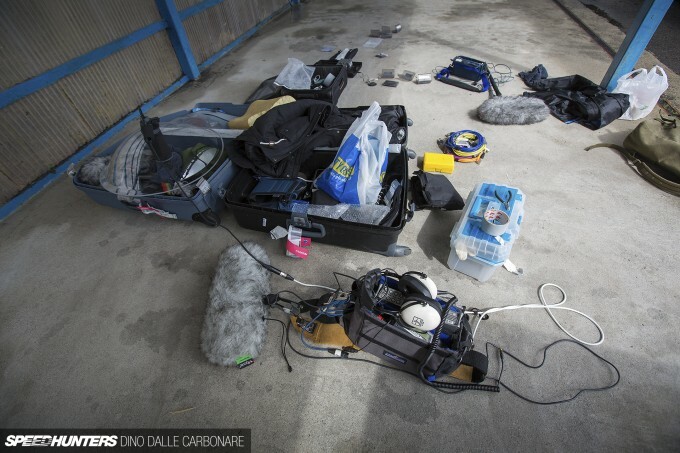 The team showed up with suitcases full of equipment, studio and on-field high-end microphones of all types, and digital recorders to capture the multitude of audio tracks they would be recording for each car. 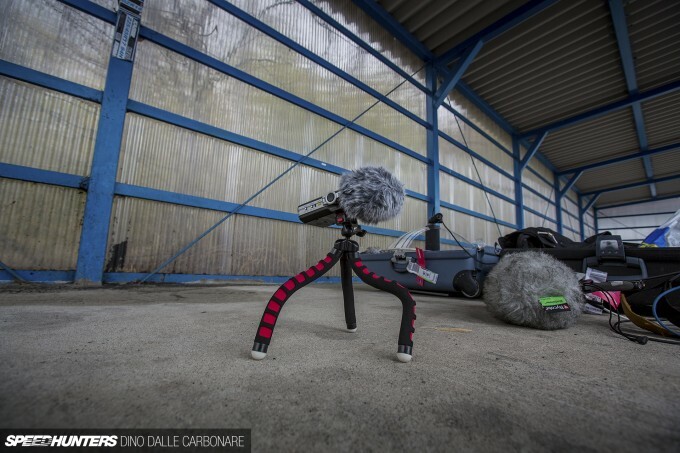 The set-up and positioning of the various microphones was the hardest and most time-consuming part of the whole exercise. These guys knew precisely what they needed, how to get it, and from which place on the car’s body. 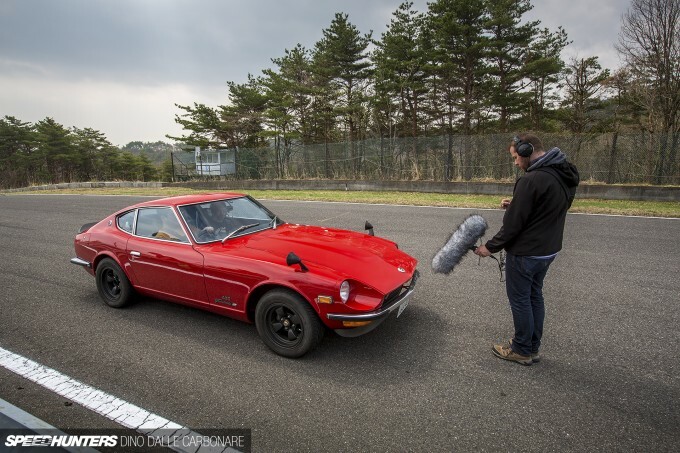 They had just come from another audio session over in the US where they took recordings of many cars that will appear in the game when it’s released next month. 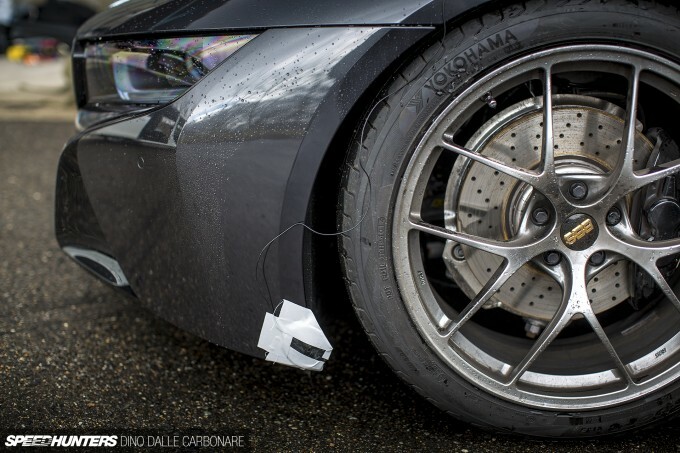 Seeing as the i8 was only being used for the various frequencies the Yokohama Advan Sports would generate as I attempted to drift the car under electric power at Ebisu’s ‘Kuru-Kuru-Land’ (what is in essence one of two skid pads within the compound), the mics were positioned at various points around the front and rear wheel arches. Recording only the close-range sound of the tyres is just a fraction of the total sound the engineering team would need though. 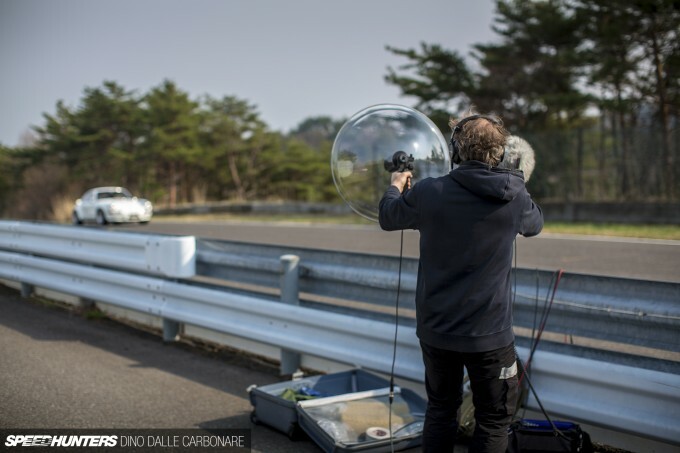 There was also capturing how the sound travels through the air at various distances, and the natural reverb that the surrounding Fukushima mountains would create. It all counts, and it’s all needed. The initial problem we had on the day was that it had been raining heavily until early that morning and the skid pad was still not fully dry. 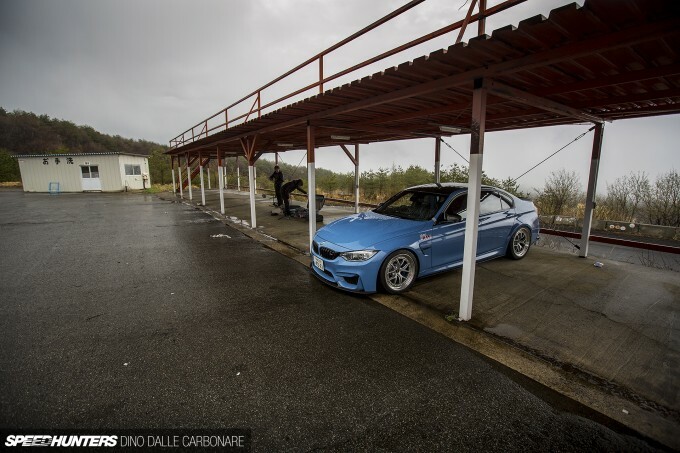 With Andy and Emily of Power Vehicles having their offices within the actual track complex, a quick call was made to see if they could come down the mountain with one of their drift cars (they have a lot of them) to do some skids for us. 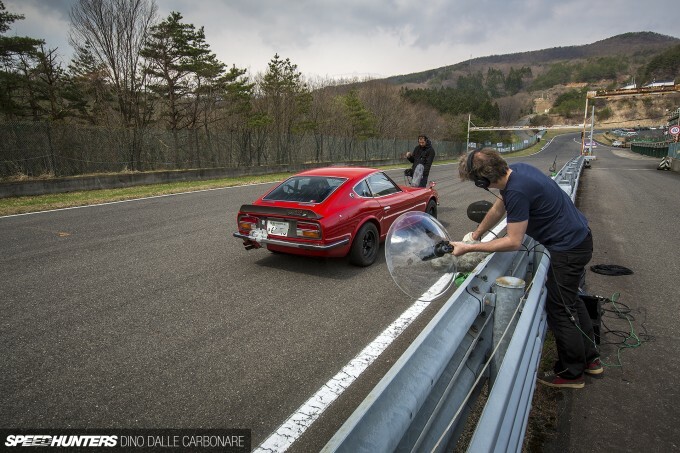 Mathias, the chief sound engineer for NFS, took the opportunity to get out one of his fluffy microphones and start recording authentic tyre squeal courtesy of the soon-to-be-killed rubber on Andy’s JZX90 missile. What a start to the week! 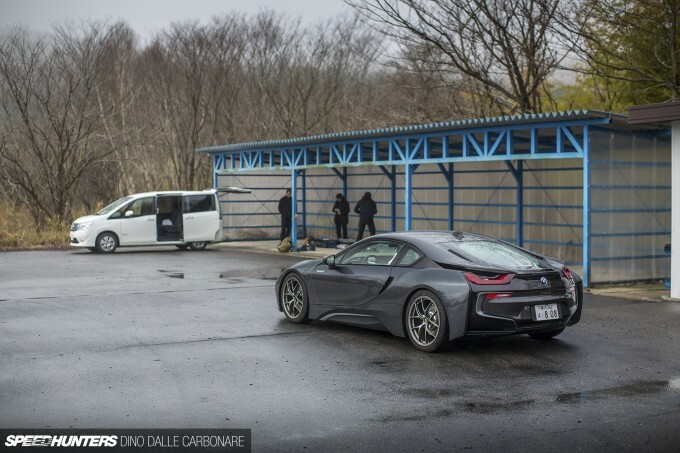 While the guys were doing the prep I quietly paced up and down the pits wondering if the i8 really had enough juice to allow me to coax it into something resembling a drift without having the three-cylinder turbocharged engine crank into life and ruin things. I also had a good look at all the equipment they had, which took me back to my university days when I used to play around with synthesisers, samplers and sequencing software. With everything plugged in it was on to checking out the levels of each channel and doing a few tests. Riding in the car with me would be one of the engineers, his job to carefully monitor all that was being recorded via well-insulated studio headphones. Depending on what we got, he would then tell me to either drive more or try something else. 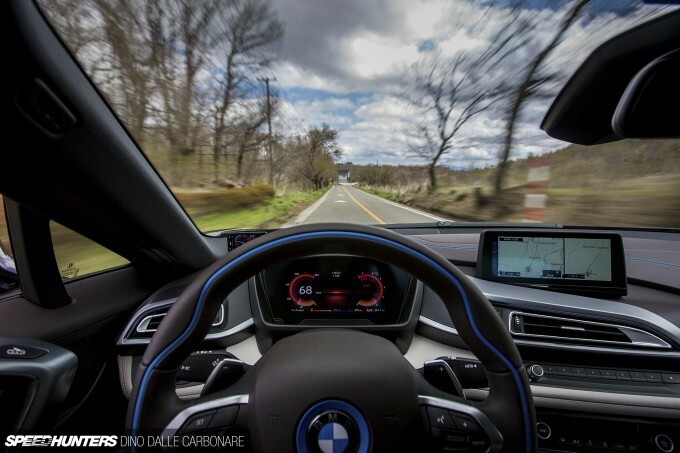 As anticipated, the i8 isn’t the most powerful car when it’s running only on electric power! I found that as I progressively fed all the power as we went around the skid pad it would grip like it was on rails, without so much as a peep from the tyres. This wasn’t going to work. Seeing as we needed to capture a constant squeal, I ended up spending most of the first outing understeering the hell out of it, getting exactly the kind of unspoiled, long sample of sound that the guys were after. 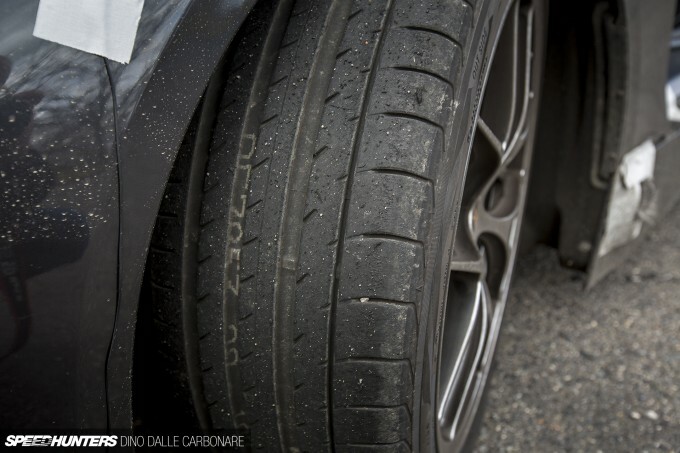 I often changed direction to keep tyre wear the same on the left and right sides. The other issue was that the battery kept draining. Two to three minutes on the pad and the range went down to zero and the engine kicked into life. To fix this I took the car up to the North Course and did a few laps. This worked initially, but I noticed it was just taking too long to charge. The answer was to take it on normal roads and let it cruise down the hill to get a nice charge going, and then head back up to the track, juggling the throttle so as not to dip into the electric power reserve. It was pretty frustrating, but we got enough time on the pad to get a nice series of recordings. 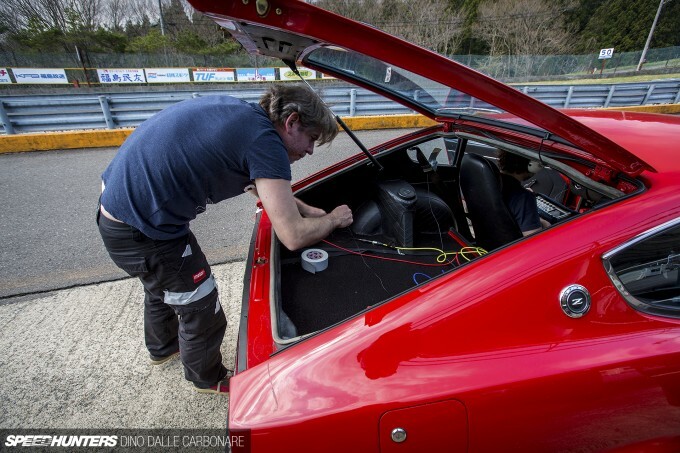 Then it was time to see if it would drift – something it has no problem doing when you have the gasoline engine at your disposal, but not in E mode. I quickly discovered that if I took enough of a run up as I came down the hill before Kuru-Kuru Land, I could enter the pad at high speed and throw in the i8 to get that tyre scrub sound that you hear when cars start going sideways. It was fun as hell to do and luckily just the sort of sound the team were after. Everyone was happy, except for the tyres! With the isolated tyre recordings in the bag, the i8 was stripped of the microphones and sent back down to Tokyo on the Studie AG transporter. 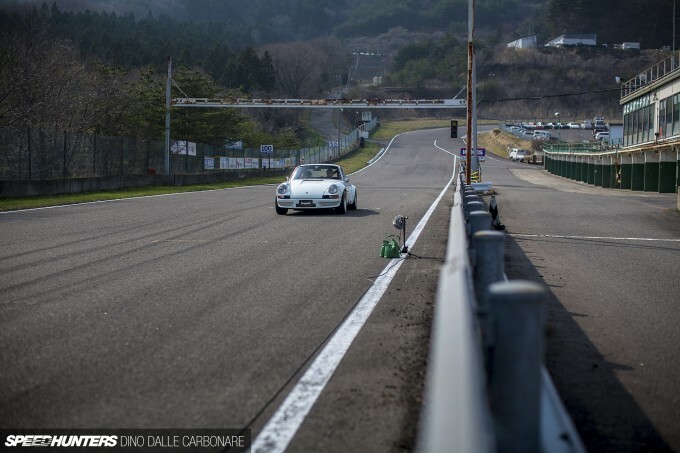 We had another car waiting for us all the way up at the North Course, one of my favorite tracks at Ebisu. 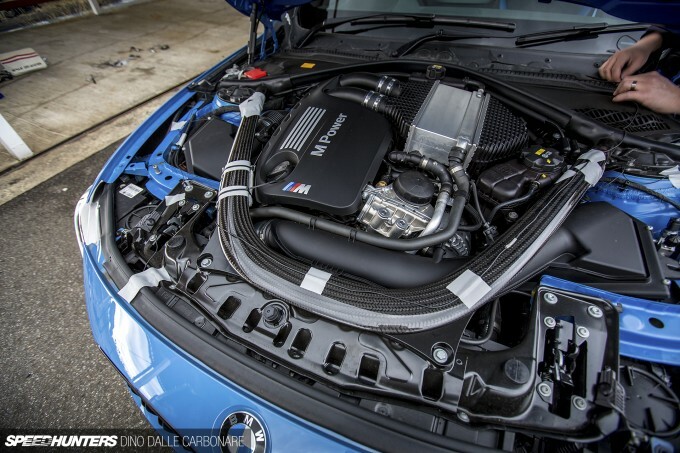 The car in question was the Beifall F80 M3, which I featured a few months back. The idea was to grab a huge variety of sounds from idle all the way up to redline: full load accelerations, dramatic starts with lots of wheelspin, full power stops to engage the ABS and get some squeal, all the way down to doors opening and closing. Compared to the i8, this was going to take a hell of a lot longer and potentially be a hell of a lot more fun! But microphone prep and positioning was going to require some serious time. 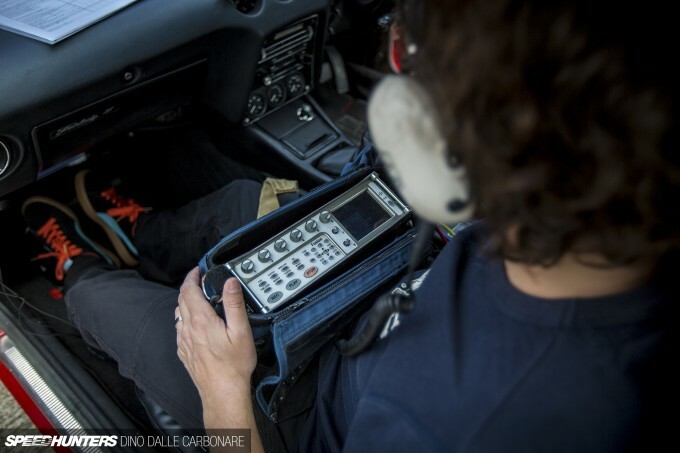 Each one was recording different frequency spectrums that could later be combined in the studio to create an accurate sample of the car. 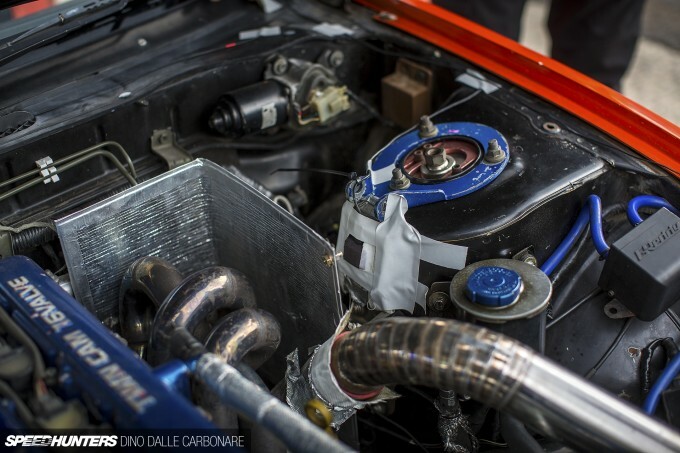 The engine bay too was laden with microphones – one on the turbo side, one on the intake side, and one on the air box. Mic positioning is one thing, but there is also a ton of wiring that goes along with it and each cable had to be secured all the way along its path into the cabin. Thankfully the F80’s rear seats folded down. All cables led to the big digital recorder that would store every channel at the highest sampling rate possible, not to mention time-stamp them so that they could be synced with the other recorders out on track. Everything was ready to go, but the weather had other ideas. The skies opened up and the track got real wet, real fast. I took the BMW out for a few laps but there was too much water splashing sound being picked up. The other issue was that the M3 was lighting up the tyres as soon as I went for the second gear pull to redline; the car snapping sideways where the main straight takes a slight left kink. Using traction and stability control was a no-go as it interferes and alters the sound of the engine too much when the throttle is cut or the brakes automatically applied. We tried third gear but the straight just wasn’t long enough to get to the limiter. We called it a day and thankfully got the okay from Beifall to hold on to the car until lunchtime the following day. It was a bright and early start the next morning and thankfully the weather was playing ball this time. The BMW was rewired, and recorded. With so much to do in such a short few hours I put my camera down and got behind the wheel and tried to make sure we were getting what was needed as quickly as possible without needing to repeat runs. I had a blast with this tuned M3; it’s a true beast of a car, extremely well set-up on its KW suspension and Advan Neova shod BBS Motorsport rims. What a car, and what a sound thanks to a titanium Akrapovič exhaust. Next on the list was one of Power Vehicles’ many drift cars. 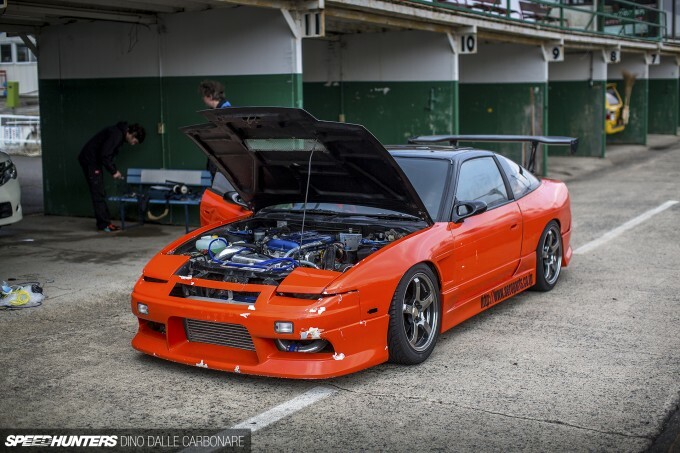 We needed to capture the sound of a well-tuned SR20DET and this orange 180SX was just the car. It was running a generously sized turbo upgrade and a properly built motor with well over 400hp on tap. Andy turned the boost down for me as it was it too fast and that was going to give us too much wheelspin. The microphones were then positioned, with a couple at the back to get that signature SR tone. Make sure you click on the player above to hear a sample of the actual recording. A few more mics were positioned in the engine bay, and as you can see, one was mounted on the suspension turret to capture all the fluttering and whooshing. The one on the Blitz filter, well, I think that’s self explanatory! By the time I jumped into the 180SX I had a good mental list of all the passes, accelerations, and fly-bys that had to be done, so we stormed through the recordings without a glitch. A quick pull of the handbrake and a clutch drop also made U-turns at the top and bottom of the main straight super fast, further bumping our efficiency. And yeah, it was super fun! Our final car for the day then turned up, and we all stood there in awe as the GruppeM 2.8L RSR replica was unloaded and brought into the pits. I had seen this car many times before, but it was always tucked away inside the GruppeM garage. I was really looking forward to hearing the glorious sound its air-cooled motor would generate. Finally, it was there in front of me, purring away with a slight lumpy idle as the engineers fitted it up with mics and did their countless sound and level checks. However, I was not going to get to drive it. That was fine by me too as it’s an extremely valuable car that I wouldn’t have felt right thrashing on the track. 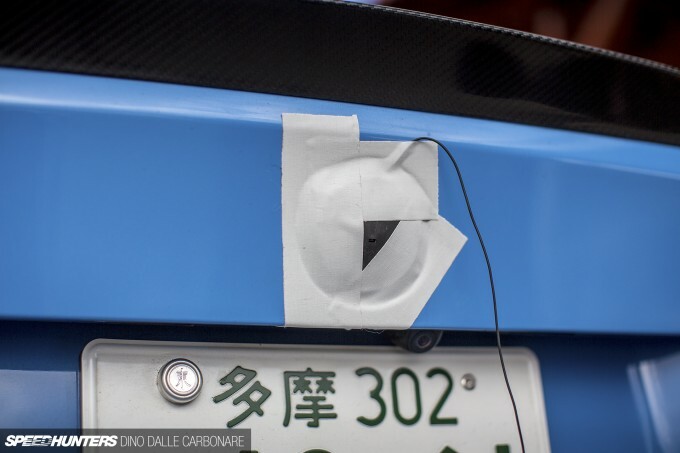 The driving would be done by GruppeM’s chief mechanic who had also transported the car up to Ebisu from Saitama. I could finally pick up the camera to get some more behind-the-scenes shots of the actual recording, something that thus far I hadn’t been able to do. The sounds checks for each channel revealed that some mics were not connected properly, so wires were checked and problems fixed. 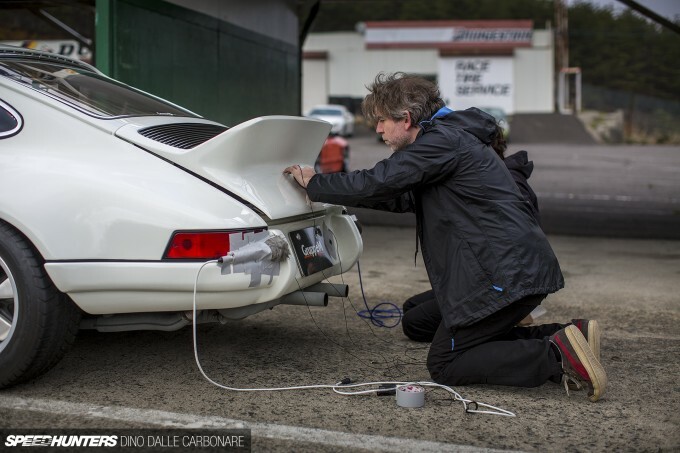 I kept drooling at the sheer beauty of a wide-bodied and duck-tailed ’70s 911 sitting on the only wheels you would ever need on a car like this. 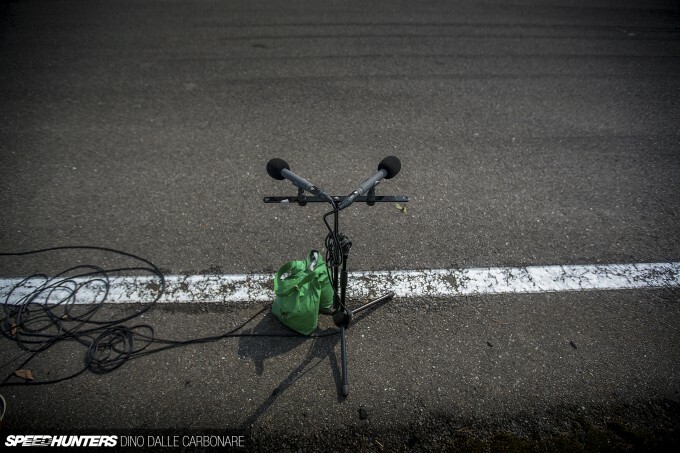 For the on-track recordings a range of different microphones were being used, each with their own sweet spot. This pair were some of the ones laid out along the main straight to capture channel-to-channel sounds as the cars passed by. 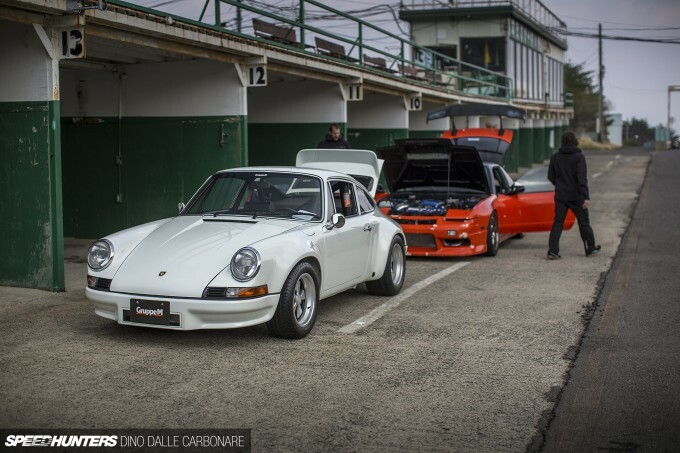 The 911 sounded glorious out on track, and seeing that the engine had to be revved out to redline, it was goosebumps all the way. Mathias was positioned far away from the other engineer and captured the engine as it ramped up through the revs. I actually tried listening in to the sort of sound this zoom microphone captured and I was truly blown away. As soon as I put the headphones on it was as if someone had turned up the sensitivity dial on my eardrums to 1000. All of a sudden I was hearing gusts of wind move leaves on surrounding trees, and birds chirping in the distance sounded like they were all around me. It was like gaining an additional sense to the ones we already possess. Now I understood why we had to stop recording every time we heard race bikes go out for some testing on Nishi Course! 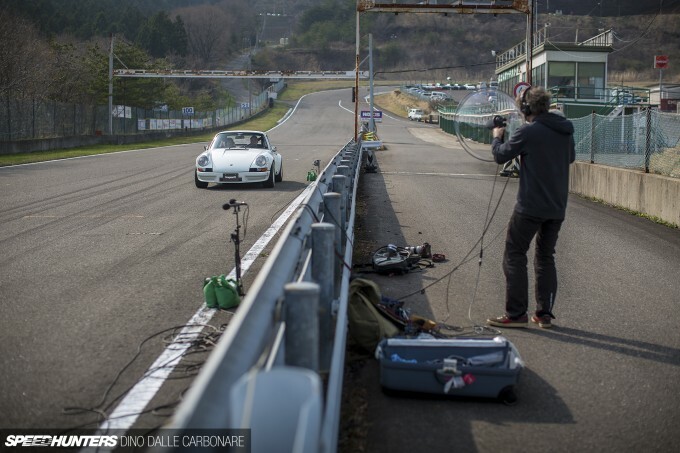 With the GruppeM Porsche captured, we packed up the gear and took a little drive around Ebisu Circuit to see what else was happening. As we were heading to Minami (the South Course where D1 events are held) we stopped by the Power Vehicles offices for a chat, and after casually discussing how cool it would be to record proper sounds of cars drifting, Emily had already jumped in a JZX90 MarkII and headed down to the School Course. The car was quickly set-up with a bunch of microphones and Emily did her thing. This was an unexpected bonus and the engineers took full advantage of capturing high quality sound of tyres being abused in a beautifully quiet location. It was like we had a massive outdoor recording studio all to ourselves. 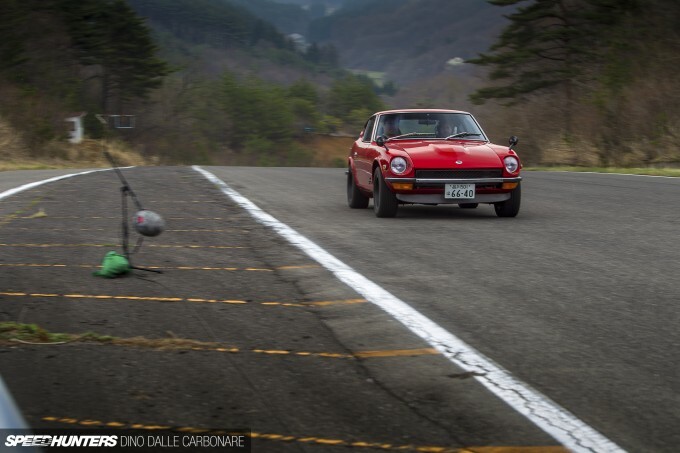 The following day we were back at Higashi Course, where a final, and extremely rare car was waiting for us. Have you figured out what it is yet? 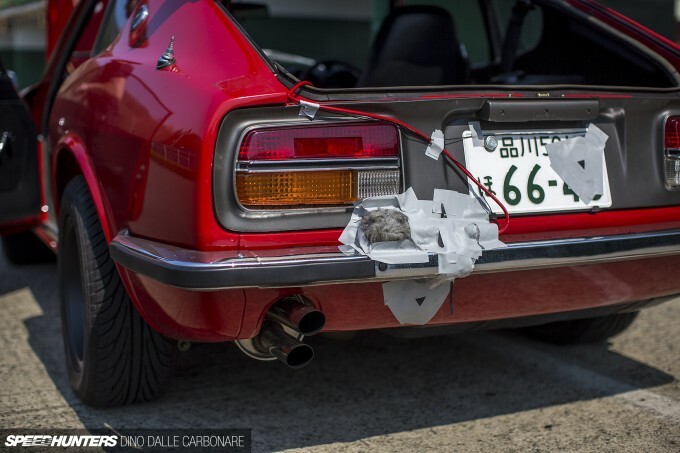 This is one of a select few S30 432Zs that Ando-san at TA-Auto has painstakingly restored. Since it was finished two years ago this car has graced the cover of Nostalgic Hero and has participated in three Marronier Run classic car rallies. I was the co-pilot for two of those if you recall, and the car has been maintained in tip-top condition by its owner. 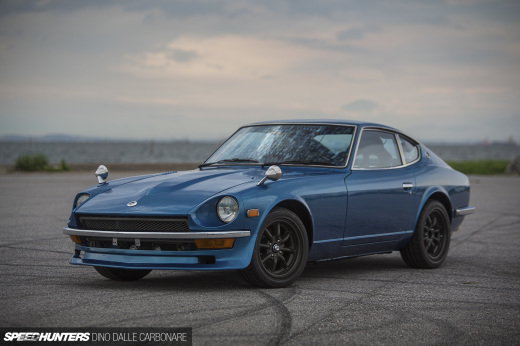 Of course, what makes a Z432 very special over the L-series powered versions is that it runs the 2000 GT-R’s S20 straight-six engine. I was so happy that a proper S20 would be recorded for the game too. 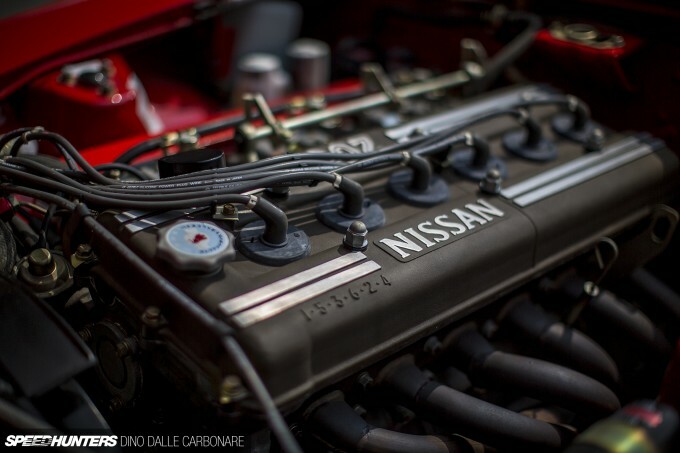 It might not be the most powerful engine Nissan has ever made, but it sure knows how to sing. 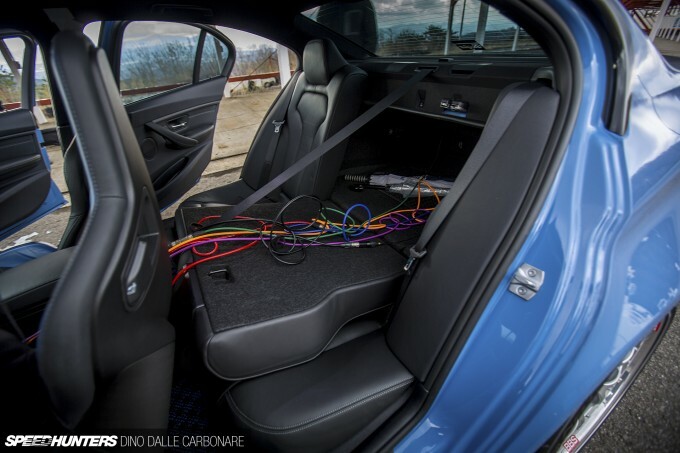 The wiring was passed from the rear microphones and the ones placed in the engine bay back towards the passenger side seat. Again, this was the place the recording engineer would be doing his job from. 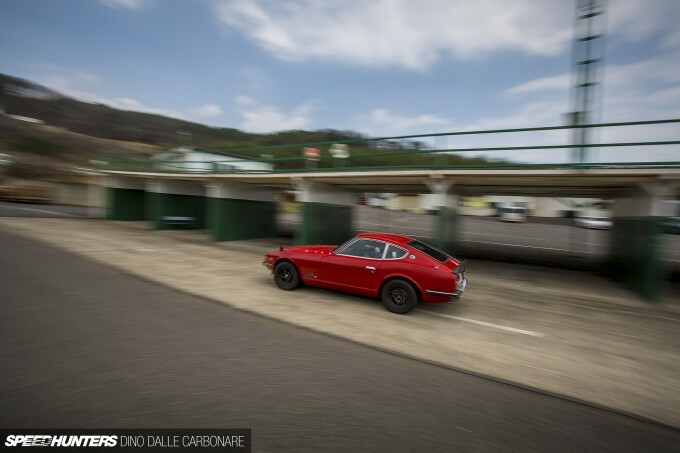 This 432Z has pretty much doubled in value since its restoration was completed, and seeing its rarity it was a good idea to gently warm up the engine and gearbox before subjecting it to a good old fashioned thrash. Like I mentioned before, aside from the engine there were many other sounds that were captured, even the doors opening and closing, which in an old car like this sound pretty unique. We had some issues with more race bikes being tested on Minami, so the engine being turned on and revving sounds took a while to get clean recordings of. That week spent up in Ebisu was a real eye opener for me. It was almost as if I was taught how to enjoy cars from a whole new perspective. Seeing these sound professionals do their job made me appreciate what I already love so much from a totally different angle. Extremely excited for Need for Speed! I'm not playing if there are no manual transmissions. I'd really, reeeeally like to play another good NFS mind you. I need it. Now we only need smell! Eargasm , if there's a word so to describe what I just listen to . I especially like the Nissan S20 ... love the old school carburetor suction sounds . It would be really cool if every feature car article had a soundtrack of noises the car makes to listen to while reading. Do you happen to know what types of mic they were using? Very nice. As soon as I saw the picture preview on the homepage I thought about that Beifall M3. And voila, it makes a return in this article! Same track hey? (according to the beta) i would buy right on the release. now i may buy it on sale sometime just for the cultural part. Truly a high level of demand and dedication. I appreciate all your efforts guys, and now even more once I finally get my hands on the game as soon as it gets out. I'll be thinking of your hard work every time my car makes a sound. Now if only you guys could teach a thing or two to that other car game company from Japan. GTAWiseGuy NeedforSpeed Speedhunters Yet they will still sound all the same like every other game! Dustyn Martin Glad you liked it! Good luck with your future career! You guys are the reason why I buy Need for Speed! To me it's all about the sounds! Benjamin O. Karslund from Denmark. 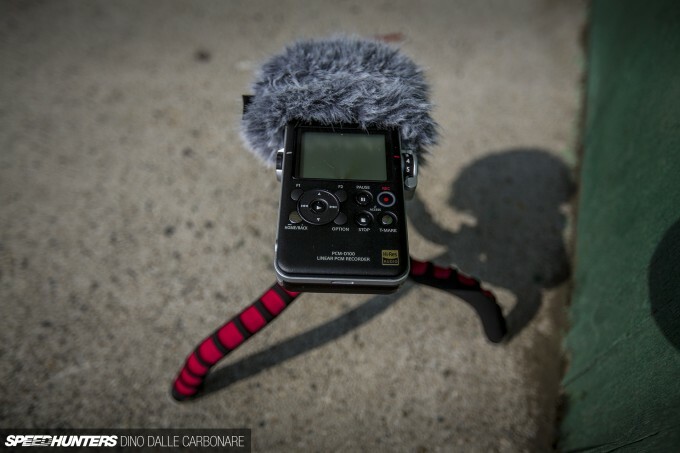 The parabolic mic a.k.a "zoom microphone" is a Telinga Universal MK2. 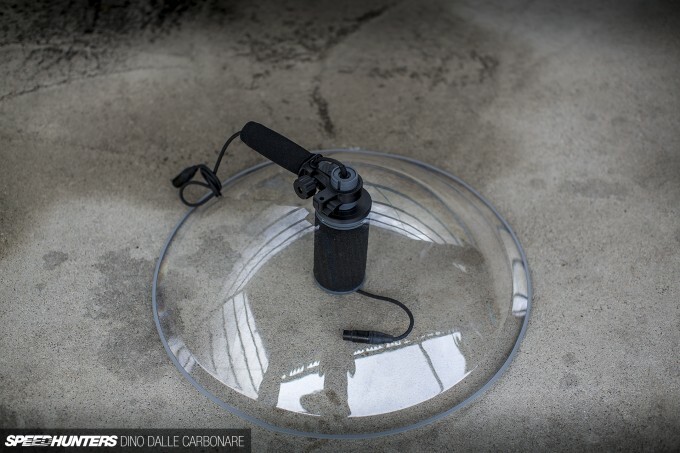 It's available from Telinga.com, you can use many different mics with it, it's portable with a foldable dish they invented long ago... For the rest of the mics my guess is Schoeps/Sennheiser/DPA, the usual suspects?! Sarebbe perfetto avere l'articolo in Italiano. if only the gran trismo series had somewhat legit sounds i would play it 10x more, but nope sony (and the other company that works on the game) only cares about driving and tracks. dont get me wrong i love that, but it is missing so much. i hope nfs will one day band together with gt and make the perfect game. Is the z in the game going to have 432 badges and specs too? 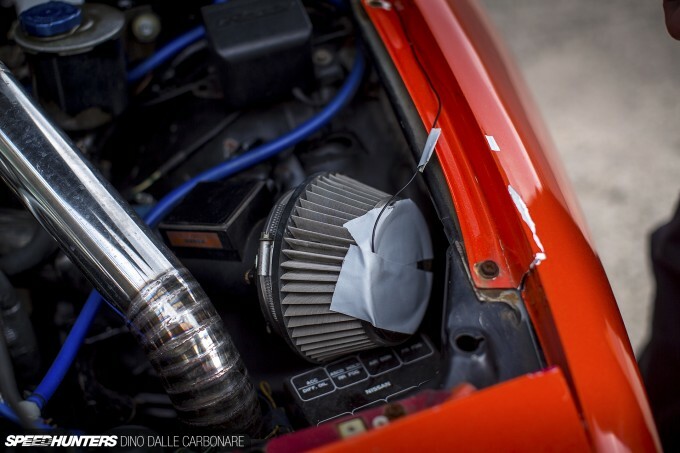 A lot of z guys are rooting for an l28et swap option. This is why I like the game and buy it . All teams behind the Need For Speed keeps surprising me . Never give up doing the best . This sounds like alot of effort for this gamen, so it'd better be good , regardless of the hype! One thing that each NFS has always been consistent with is the car sounds. Each game, no matter which developer be, Black Box, Criterion, Ghost, and even Slighty Mad Studios (who's sounds are loud and kinda exaggerated lol) they seem to get it right. This iteration is no exception and I cannot wait until November 3rd! Dustyn Martin Audio Engineer specialising it automotive would be an awesome career path! Did they just leaked an BMW i8? Rodri2897 NeedforSpeed_ES No hay posibilidades, los pocos que los piden no son suficientes para que se lo planteen siquiera. Yep, Porsche unleashed was best. 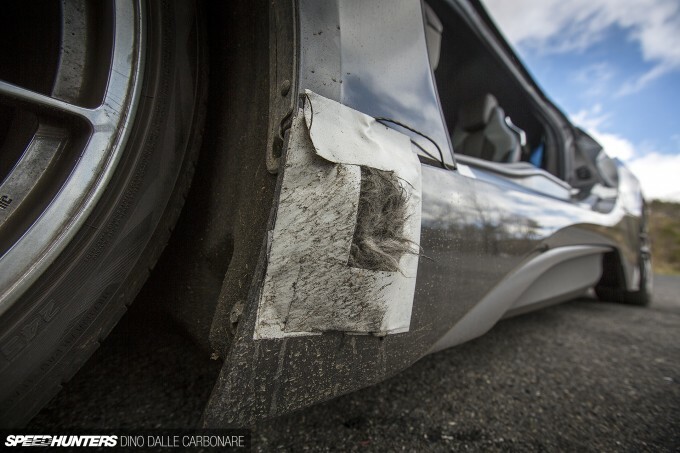 speedhunters_dino Dude, I have like a pretty funny story from the beta. So during day 1, I kept repeating, "If I don't see the Liberty Walk, Rocket Bunny and Bensopra kit for the R35, I'm gonna go to Ghost directly and tell them Dino didn't do his job as the JDM input guy (and more importantly the R34 guys!). Eventually I unlocked the R35, and I remember holding my breath as I scrolled through the bodykits. LB, check. RB, check. Bensopra, definitely a check. I clearly remember jumping out of my seat wearing nothing but my undies as I ran around the house yelling, "DINO DID HIS JOB, DINO DID HIS JOB!" Great job on the input, man. 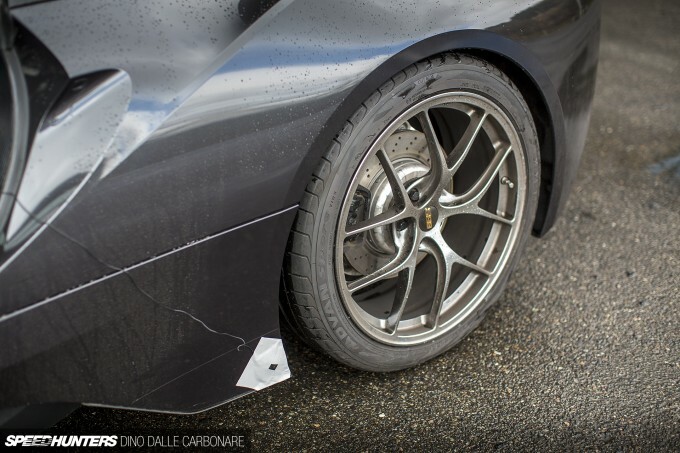 why http://www.speedhunters.com/2015/10/nissans-take-over-sodegaura/ 350Z 370Z !!!!!!! NONONONONO !!!!!!!!!!!!!!!!!!!!!!!!! Thank the gods for Need For Speed giving us Speedhunters, and for Speedhunters giving us back Need For Speed. Out of all the car games, I think the Need for Speed games have the best sounds even stretching back to the ps1 days. @John Wayne We thought the same thing, it really adds something to an image right? Look out for some more testing of this in the future. No videos? Interesting. I'd like to know how in game so many sounds are still completely terrible and non-matching to the actual cars recorded, clearly either you guys or ghost games are terrible sound engineers as even to this day the hoonigan mustang still sounds completely WRONG!